If on a family vacation or if you are traveling solo to Angkor Wat, near Siem Reap Cambodia, do not miss visiting the Cambodia Landmine Museum. This is a must for everyone traveling to Cambodia and can create a great educational moment for the whole family, even traveling children that are mature enough to understand history. It will only take you around an hour to complete the audio tour around the small building. But you will leave with a wealth of knowledge and understanding about what Cambodians have endured over the last century. Even if you you are not traveling to Siem Reap you need to know about the Landmine situation in Cambodia. The Cambodians are a resilient and gracious people who will most definitely capture your heart. regime known as Khmer Rouge. By seventeen he defected and fought against Khmer Rouge. 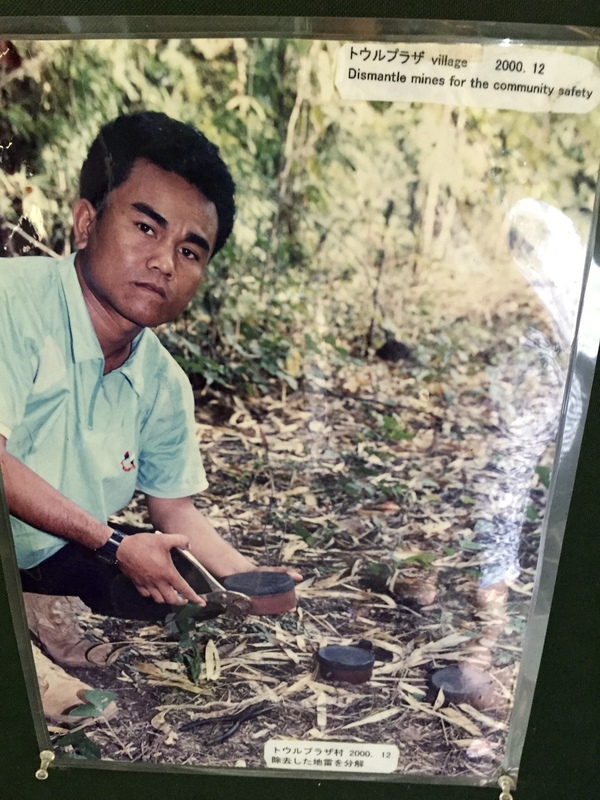 In 1993 he began his dangerous life long mission of clearing land mines all over Cambodia. It is estimated he has cleated over 50,000 mines. That’s 50,000 lives he has saved from destruction. 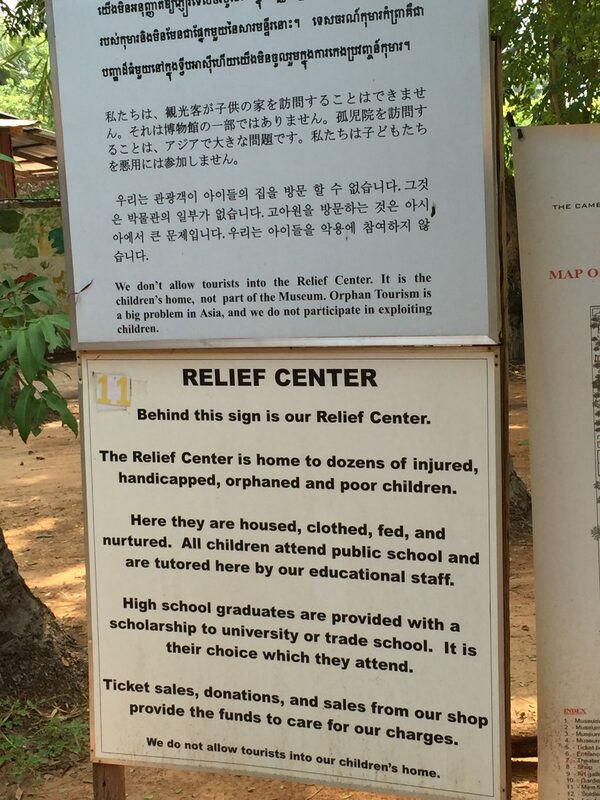 Not only does The Cambodia Landmine Museum educate and support the clearing of dangerous mines, they have an onsite Relief Center that is home to dozens of injured, handicapped, orphaned children. Thousands of Cambodians have lost legs, arms, feet and lives to land mine explosions. Some believe there are still between 3 to 6 million mines left in Cambodia. Cities and Heavily populated areas like Angkor Wat have been cleared. But villages, jungles, and family farm fields are where mines are commonly found. Children, mothers and fathers, stumble on 30 year old mines in their own land and lose a limb. The work of locating the bombs and disarming them is slow and time consuming, but essential for protecting innocent lives. Where did all the bombs come from? Pretty much every country contributed to the littering of the bombs, even Cambodia themselves. Some are undetonated bombs that were dropped in air raids, and some are actual land mines that were placed. 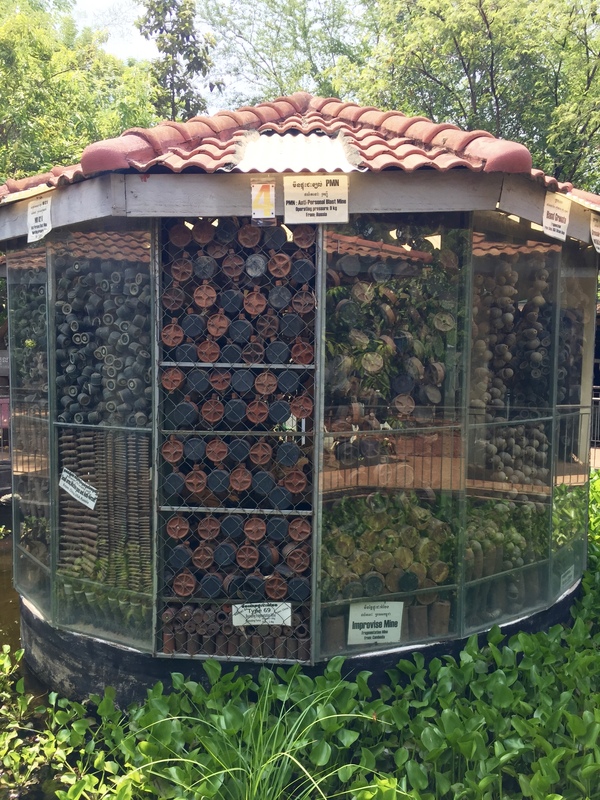 The bombs date back to WWII and of course the Vietnam War, and then the Khmer Rouge Regime. The museum has a display of all the different types of bombs, and also a store of bombs that were disarmed by Aki Ra himself. How can we help? First step is reading this article and being informed. We spend so much of our lives in our own little bubble, being aware is half the battle. This is why at Bring Learn Grow (BLG) we encourage family travel and allowing kids to experience different cultures. Next step, visit the Cambodia Landmine Museum while traveling in Cambodia. All proceeds collected at the museum are used to deal with the landmine situation. In fact, the $5 fee is divided up; $1 towards clearing landmines, $1 towards supporting programs in local villages, and $3 to care for the victims housed at the relief center. That’s $5 well spent! They also have a gift shop where you can purchase gifts hand made by the children. Cambodia does not encourage trying to visit orphanages or Children’s Homes as tourists. However, there are many opportunities to serve while traveling with your family. Bring Learn Grow calls this a Servcation™. While traveling in Siem Reap, visiting the museum is an excellent way to lend your support to this tragic situation. Do not miss this opportunity for yourself and your family to visit Cambodian Landmine Museum. Remember, BringLearnGrow is all about traveling and experiencing other cultures and history so we can deepen our compassion and understanding of the world.